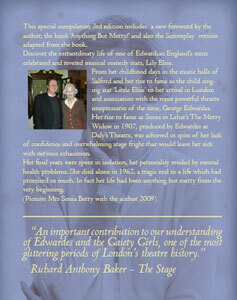 I was delighted to learn that someone had taken on the huge task of writing a print biography of Elsie. Such a project would be so much more time-consuming than compiling a web-archive such as this. The author, David Slattery-Christy, tells us in his Forward that what follows is, of necessity, a blend of the available facts and his imagination. Elsie’s early life is particularly lacking in documentary evidence, so the degree of imaginative in-filling was obviously going to be greatest at the start of the book. I do wonder then, why the author chose to commence his narrative at the moment of her birth. Once past the opening chapter we quickly move into the familiar series of events that constitute what we know of Elsie’s brief career on stage. This is a short book, under 150 pages for the actual biography. (The remainder of the volume consisting of complementary images and reference material.) However, within those pages the characters around Elsie are capably brought to life. The facts we have, events, dates, and a few contemporary quotes from friends and admirers, are developed into a very readable narrative. The mixture benefits from the addition of a little dramatic spice, the plot line centring on Hodder for example. I admire David Slattery-Christy for taking this on. Especially in light of the minimal factual material available to him. It is a good, dramatic, read and you will end up knowing Elsie by the end. September 2014. 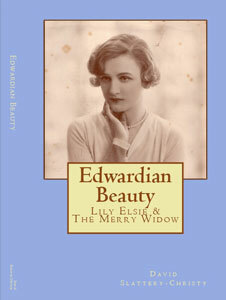 A special edition is released titled 'Edwardian Beauty - Lily Elsie & The Merry Widow' - it includes the latest book, plus the Screenplay adaptation and also a new forward with a bit more information about Sonia Berry. 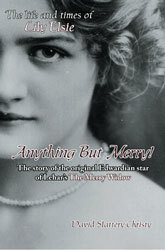 There is a lovely picture of Elsie on the new cover. January 2012. A new edition of this book has now been published, enhanced with significant new material. The new edition has a new last chapter and an introduction, plus an index section. There are also some new images, including Elsie on the beach at Biarritz, with Ian at their farm in Gloucestershire for the hunt, and there is also one of Elsie in Court dress. In Search of Ruritania & Anything But Merry! David Slattery-Christy is a writer very much in tune with British society during the first half of the last century. David has an amazing gift for bringing back to life the bustle and allure of London’s West End in the days of Daly’s, The Gaiety and beyond; above all, the personalities who illuminated them whose charismas have very inadequately been captured by recordings. The DVD of Novello in the 1932 film of his play I Lived With You gives, perhaps, the best idea of his light, comedic touch; whilst only a few scratchy, mono recordings survive of Elsie’s glorious voice. The adolescent Novello was a huge fan of Lily Elsie who made her name as Lehar’s ‘Merry Widow’ in 1907, going on to star also in A Waltz Dream, The Dollar Princess and The Count of Luxemburg. She later appeared opposite him in his play The Truth Game (1928). Older by then, but still very attractive, it was to be her final stage appearance. You’d have thought such an incandescent performer would have been blessed with a fulfilling life. But she was riddled with demons, tormented by stage fright and even her hoped-for happily-ever-after with a handsome, wealthy husband, ended in tatters. In the 1950s she had a lobotomy in an attempt to save her fragile mental health, but it only helped destroy her personality further. Nevertheless, Anything But Merry! successfully evokes the world of the Edwardian operettas and musical comedies, and reminds us of the life of one of its glittering, yet sadly forgotten performers - and the sometimes incalculable price of fame.